We offer you to uate the comfort of the trip in a luxurious car through renting Kia Optima in Kiev at an affordable price. The car falls into the category of business class and is one of the best examples of Korean car industry. Economical and practical sedan with a big body amazes with its ergonomics and attractive design. Everyone can underline the high-status and have a good sense of direction in the metropolitan traffic with this car. 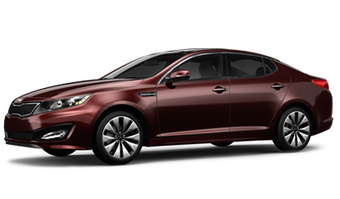 Long rent of Kia Optima in Kiev can be arranged quickly at any time of the day (ordering service works round-the-clock on the website). Four-door sedan has a wheelbase of considerable dimensions (more than 2.5 m). Vehicle configuration with diesel and gasoline engine is possible. Engine capacity makes 1.7, 2 or 2.4 liters. There six speed rates in the automatic gearbox. Everyone who wants to decrease expenses for fuel might be interested in the hiring Kia Optima in Kiev because the car is equipped with a modern economy system. It is easy to drive a car thanks to the ergonomic steering wheel with 3 arms and 2-way regulation. Mode “start from high ground with a quick descent” is foreseen. Offered by the “Rental” company Kia Optima hiring in Kiev does not include chauffeur service. They are not necessary, though. Modern steering system of the Korean auto provide a good flexibility and motion stability on all the types of the road, which guarantees the easiness of driving. The offered and affordable in “Rental” car hire in Kiev stands out from competitive offerings with its cheap prices, wide choice of service plans, high quality and safe technical condition of cars.